Blessings! I have returned from Israel safely, and will be in Colorado until September, (at which point I will be making Aliyah)! My life is taking me in a very exciting direction, but before I move away, I would like to spend time working in my hometown community. If you live in Colorado, and are a part of your Synagogue’s Sisterhood, a day or overnight camp, have weekly gatherings with friends, or want to learn about the art of living foods and eating yourself to nourishment, please contact me! I would love nothing more than to help you feel your best, through high quality, new tasting, KOSHER, food! 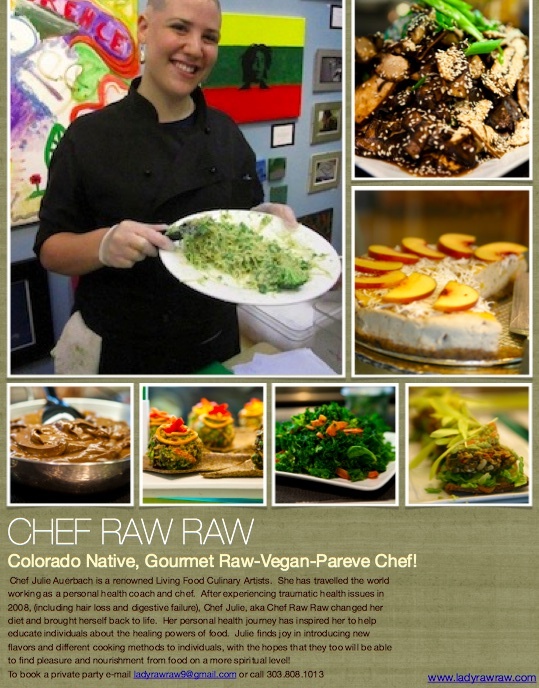 Chef Raw Raw colorado flyer – click here to download my flyer and post it in your community! Please help me spread the word! Contact me for any questions! 303.808.1013. Awesome Juju! How can I help?